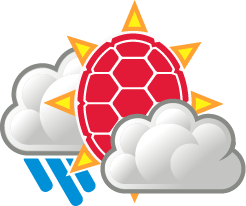 After yesterday’s beautiful weather, Terps were brought back to reality with colder temperatures in the low 50’s and scattered showers in the mid-afternoon. Don’t be fooled, heading into the weekend you should expect temperatures to dip back in to the 30’s. Most of the rain will be over by the time the sun is down, but expect cloudy skies to remain. The combination of the nightly cloud blanket and a warm air mass positioned over the area will keep the nighttime temperatures to a moderate low to mid 50’s. Additionally, winds will be negligible throughout the night and into the morning. 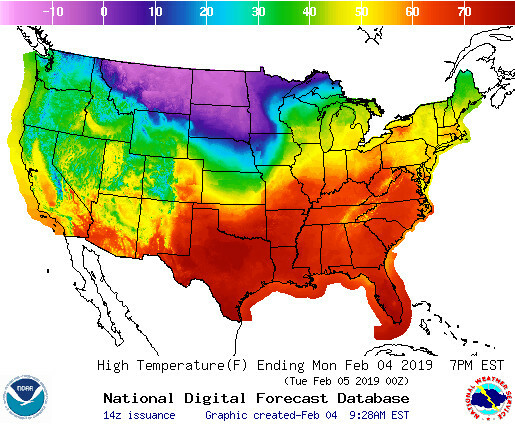 Today’s temperature map courtesy of the National Weather Service. The trend of mild temperatures is likely to continue before the weekend with tomorrow’s high being in the upper 50’s. Make sure you get any outdoor projects done while the temperatures are still manageable! The clouds are expected to carry over tomorrow as well, and with them we could see more scattered showers. As for Thursday night, expect much of the same cloudy skies, moderate temperatures, and spotty rain. The warm air mass that has stationed itself over the DMV will experience some mild forcing from a Canadian cold front, but not enough to bring temperatures back to the seasonal average. Friday’s weather will contain more mild temperatures in the upper 50’s, but the rain will have finally subsided by then. Expect partly cloudy skies and winds in the teens. By Friday night, the Canadian cold front should finally break through, yielding dry, chilly conditions for the weekend. Temperatures will go down back into the 30’s, but anything below freezing would be unexpected. Either way, plan your weekend to be outside as little as possible.